The reader should be aware that this article is not, and may never be, as funny as the truth. Still, we have time on our hands. See this article on Wikipedia. The Principality of Sealand (not to be confused with SeaWorld, who ignores our annexation requests) is a glorious country off the coast of England that is loved by many, and feared by all; at least it would be if not for the fact that no other nation recognizes its true sovereignty, probably out of envy. This land of hope and glory® conveniently occupies the space of an abandoned sea fort, standing above the English Channel, and is ruled by the honorable Bates family. Prince Roy and Prince Regent Michael Bates shield the young nation from dangers foreign and internal alike. Though the Principality of Sealand has experienced innumerable hardships and trials, it has since emerged as a powerful and respected governmental entity, despite what everyone else says. They're just jealous, the overbearing twits. Not pictured is the massive, sprawling underwater city home to thousands of royal servants and citizens. It isn't proven that the Principality of Sealand didn't originate from the very nethers of Venus herself, so we have to presume that this is so. 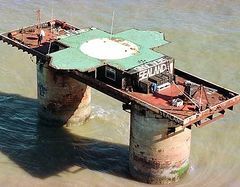 History says that Sealand was originally an old WWII sea fort that was occupied by a less than sane Pirate Radio broadcaster in the late 1960's, but we all know that history is a confusing, unclear subject, and any dissenter could fabricate fallacies to discredit others. It is in fact well known that Sealand was the true homeland of its now prince Paddy Roy Bates . For several years, the nascent nation prospered, bringing in an era of peace and prosperity within all 0.55km2 of its land. Other than a few ramblers foolish enough to trespass its borders to spy under the guise of "fishing" or "buoy repairs", Sealand was peaceful, thanks to the rule of the Bates family, and the hard work of its citizens (all two of them). Sadly, this peace was to be short lived; it was only a matter of time before someone tried to invade the country. While the Bates family was in a diplomatic trip in London, a group of German and Dutch mercenaries, led by the generally unpleasant Alexander Achenbach, self proclaimed Prime Minister of Sealand, temporarily occupied the fort, and took Roy Bates' son Michael hostage. Through what we can only assume as a daring rescue mission involving spectacular heroics, Roy Bates retook his land and saved his son. To this day, the vile invaders still wait patiently for the day when Roy Bates dies, running their government-in-exile in their mother's basement. After the Achenbach Debacle of '78, Sealand was again at peace. Benefiting from the lack of dirty foreigners poisoning the mother land with their "hopes" and "aspirations for the future", the Principality expanded, eventually reaching the dark underbelly of Cyberspace! HavenCo, which was co-owned by Prince Regent Michael Bates and Ryan Lackey, was a titular haven of unregulated data and other technobabble terms, free from the chains of rules and petty morality. Where the great would not be constrained by the small. And with the sweat of your brow, HavenCo could've became your Data Haven as well if not for its sudden closure in 2008. A large number of counterfeit Sealand passports were in circulation, used by criminals to aide in their crimes and, worst of all, not serve the motherland. Because of this, the Royal Bates family had to revoke all Sealand passports, including ones officially issued by them over the past twenty two years. On July of 2006, a fire which was allegedly caused by an electrical failure, almost threatened the existence of the young nation. The situation got so bad that a helicopter was needed to ferry citizens to safety. Luckily, the fire was stopped, and the fort was completely repaired by November of that year. Some fishermen were found within a mile of the fort right before the fire, and were executed following a thorough, one-hour investigation. Unbeknownst to most, the Magna Carta was actually based on Sealand's constitution, despite the mild time differences. 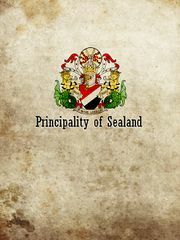 The Principality of Sealand is ruled by the Royal Bates family under a constitutional monarchy. All of the power is vested on the Royal Family and their associates. Anyone who says otherwise will be thrown off. Though this system of government may be somewhat similar to another certain island nation to the north, Sealand actually invented the concept of monarchy, and anyone using it owes Sealand large amounts of money. Claims that the Principality of Sealand is a fascist state are unsubstantiated and will be met with severe punishment from the police force. Currently, Michael Bates is Prince Regent, the head of state and the de facto ruler of the Principality, although Roy Bates still holds the title of Prince. The fact that Roy Bates would name himself "Prince" instead of "King" shows that he still considers humility a principal virtue, as do all of subjects that bask in his glory. The Sealand Royal Family is to be addressed with utmost respect, and any signs of disrespect, such as not calling Roy Bates's wife, Princess (she likes that, you know) will be met with deportation via defenestration. No government has recognized Sealand's state as a country. In fact, they believe that the Principality is merely a micronation run by a deranged pirate broadcaster that managed to evade the law by living in international waters, despite the fact that these claims are extremely silly and not-at-all true. Since the only thing that Sealand has an abundance of is patriotism and sea water—two things most people already have too much of—the Principality of Sealand currently has nothing to export; the only things Sealand imports is porta-potties and food, and both items are only to be used by the royal family (royal servants are fed barnacles and sea water). Despite the setbacks in the economy (or lack thereof), the Principality of Sealand still issues currency for use in buying and selling goods within the country's borders. To help with the monetary costs of the maintenance needed to support the Principality, Sealand has recently begun selling T-shirts, mugs, pens, and other trinkets to online buyers. While supplies last, see store for details. The country has also started selling the titles of Lord, Lady, Baron, and Baroness to people, to fill the high demand of internet users wanting to be part of royalty. Tourists are occasionally welcomed into the motherland, mostly for sightseeing and good PR. Other times, we allow certain allies into the fort, but due to the Achenbach debacle, Sealand has much more strict immigration laws than other countries. Sealand has been attacked by terrorists before, and if the rest of the world had followed Sealand's example, the Earth would've been completely free of suspicious foreigners. Sealand has had amicable relations with its allies all around the world: all two of them! Sealand has had a long and complicated history with the motherland, ranging from mild annoyance to unsympathetic apathy. Like all other nations, it does not recognize Sealand as a true country, but it does make sure not to trifle with Sealand's business: the country lies in international waters, and it is much easier to ignore someone than to be completely hostile with them if they don't directly antagonize you. The Royal Bates family originally hailed from England, and still has citizenship there, but during diplomatic visits to their previous homeland, they don't seem to be treated with the same dignity and respect as other diplomats. Yes, it's true that being a diplomat allows you free food at any restaurant franchise for life, regardless of what the manager says. Sealand has had a somewhat complicated history with Germany: Alexander Achenbach came from Deutschland, and so did a lot of his cronies. On the other hand, Germany did send a diplomat to Sealand to petition for Achenbachs' release, so according to rules set by Sealand, this was a diplomatic mission, and counts as a recognition of Sealand's nationhood, right? Russia scares us. No further comments. The future is one thing that most Sealanders are quite wary of (not Prince Roy though, he can smell time), but uncertainty has never stopped the Principality of Sealand from reaching its lofty goals. Sealand already has a film in the works, and the space program is already burgeoning, despite minor setbacks involving catapult malfunctions. Though some might cower at the face of tomorrow, we spit in tomorrow's face, tell it to cry to its mother while making an effigy of tomorrow, and then lighting it on fire with the decomposing stomach gases of tomorrow's close relatives.